Picked up a 50 hp 66 wards sea king (vwb 19090) that has a number of issues. This question is about the missing coils. Would coils from another 50 (like the 71 Johnson I have) be compatible? Also, if I find some originals, how do I test to see if they're good? Thanks, guys. Sorry I missed this till now. Which ignition does it have? Post some pictures and I can advise. Also, I have a second or the same motor which I had hoped to end up with one good motor. On both, top of top cylinder piston is pitted, bottom is OK. Wondering if it would be worth a try to replace the bad piston with the good bottom from second and hone the cylinder. I have one of the motors running. Just dont get any of the CD ignition coils. They look almost the same but have a set of ridges to mark them from the battery ignition coils. Later coils were black. Thanks for your response. Here are a couple photos of the pitted piston. What do you think? The ebay coils are off the same motor but a '65 (mine is a '66), so I expect they are the right ones. What is a simple reliable procedure I could ask the seller to perform to bench test them and provide results that would tell me if they are good or not? I also need to know how to test the alternator stator. Wow that is one nasty pitted piston. Never seen one eaten up that bad were the motor was still running. I am going to pass this picture along to a couple of guys and see what they say. I suspect lean running. Its not that often coils actually die. You can just clip lead a spark plug to the negative terminal and the spark plug connection. And a 12V source like a non automatic battery charger to the negative. Then tap the positive lead on the terminal and you should get a spark. BTW You can do this to CD coils also but you will get little spark, The CD box hits them with 200-400 volts depending on the type. The alternator stator is tricky to test statically. If you have a high end digital meter (to measure low resistance) you can compare the 3 leads to each other. They should all be within a few % of each other. If one is shorted to another the resistance will be off. None should be shorted to ground (in most cases). The consensus is... That piston erosion is from ignition advance. As in too much. Why just the top one? My guess is the top runs a little bit hotter, at least that was common in Mercurys. I would suggest snagging a couple of NOS pistons off ebay and fix one motor and put the two good pistons in the other. The timing needs to be verified carefully before running them again. Something is out of wack. We can get into that later. What might a person be hoping to gain by advancing the ignition to much, compensate for something?? My goal in buying the two engines was to use end up with one at least decent running one. I've not found pistons on ebay but will keep an eye out. In the mean time I may try just installing the two good ones in the best block. Sorry, but I'm not sure I'm following your earlier response on the coil testing procedure: "You can just clip lead a spark plug to the negative terminal and the spark plug connection. And a 12V source like a non automatic battery charger to the negative. Then tap the positive lead on the terminal and you should get a spark" could you take another stab at explaining for this first-grader? Maybe it was not intentionally advanced. Just messed up by some one who didn't have a clue. Another thought is there might be a vacuum leak that might throw off the top cylinder mixture. It could be a leak around the reed valve chest or crankcase split. Check the reed valves also. Even the shaft seals should be suspected. If the compression is still OK then the top and bottom crank seals are likely OK and the reed valves too. You will likely replace the seals any way when you go into it. A non automatic battery charger is just a 12V power supply with a couple of handy leads on it for testing. Connect a spark plug (or better a spark tester) to the tower output (HV) and the negative terminal. Connect the plus charger lead on and tap the other on the negative terminal. You should get sparks at the plug. Our Carolinas AOMCI chapter president knows Dr. Gordon Millar, former chief engineer for McCulloch (Scott-Atwater). He forwarded my email with the eaten piston to him for comment. This is his very detailed response. The piston picture came through just fine and is a classic almost textbook example of piston damage resulting from pre-ignition. This is the fundamental problem we solved at Scott/McCulloch through the use of the surface gap spark plug, Champion UJ17V. 1. Low octane number fuel. 2. Spark plug range too hot. 3. Too much spark advance. 4. High engine temperatures, poor cooling. The reason that it sometime occurs in only one cylinder of a multi-cylinder engine is because some of the variables listed above can be different from cylinder to cylinder. As these engines always run on the very edge of destruction, it doesn't take much to push them over the edge. 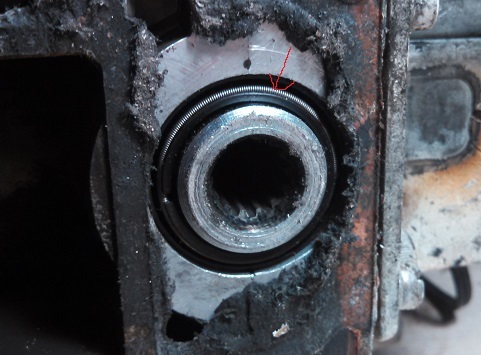 The piston damage shown in the photograph is normal (if you can call it that) pre-ignition, not runaway pre-ignition. Runaway pre-ignition is where destruction of the piston occurs in 20 to 30 seconds and there is usually not much left to photograph. It is an exciting event on a dynamometer test stand. There are some things an owner/operator can do to minimize pre-ignition. If he is running a high output ignition system with the surface gap plugs, pre-ignition will not occur. 1. Run the highest octane number fuel available. If you can get 100LL avgas it works great. 2. If your engine will not run with surface gap plugs, at least go to J4J and nothing hotter. Some of the R series plugs work for a while, but are subject to low speed fouling. 3. Make sure your spark is not over advanced. My 50-year old recollection is that 40o BTDC was the limit. Some very nice self-powered ignition timing lights are now available, so an operator can actually check this if he wants to. 4. Check engine cooling, make sure the cooling pump is working, the cooling passageways are not clogged and the thermostat (if the engine has one) is operating properly. 5. Make sure the engine is not operating too lean. With variable jet carburetors, open the main jet one-quarter turn from peak RPM. If carburetors are fixed jet, make sure they are clean and the float level properly set. 6. Do not over prop. An engine that is not allowed to run at its rated rpm is prone to pre-ignition, as our older engines did not have automatic spark advance. New engines might be different. When I was Chief Engineer of Scott/McCulloch, pre-ignition was our biggest headache. You should have sent along a box of Excedrin with the picture, because even the memory of this disease gives me a headache. Thanks, really appreciate all the instruction. Attached it a photo. The spring retainer around what I guess is the seal at the bottom of the shaft was hanging loose when I removed the mid and lower units (I put it back in place). I think I read somewhere this could indicate a problem with the shaft (which I'm guessing could be a big deal). What do you think? I'll have to recheck the compression once WI weather permit. Image above now. Since the spring retainer (see red arrow) was hanging part way off when I dropped out the gear case, my question is, is that an indication that the crankshaft, seal, bearings, etc. may have problems, and can I ck that? Thanks. Doesn't necessarily indicate their are any problems. If the seal is not sucking wind and the lower compression is good then put it back together and test run it. Back to this project now of trying to end up with one decently running motor from two motors with issues. One initial question is what sources are there for replacement gaskets, seals, etc. and is it reasonable to make gaskets from sheet material? Thanks. Years ago my brother bought a 13-1/2" Sea-King boat and it had the original Sea-King 50hp just like yours. The motor was in very good shape, but not big enough for skiing. So, I found a $25 Merc 700E Dockbuster on the bulletin board at work, fixed it up and slapped it on the Sea-King. It was a mad skiing machine! We sold the 50hp and got good money for it. They are one of the better motors Chrysler produced and there are still a lot of parts out there.